Prvi Partizan was founded in 1928 and is located in the town of Uzice, Serbia. They have helped supply police and military agencies all around the world, as well as produce ammunition for the consumer market. 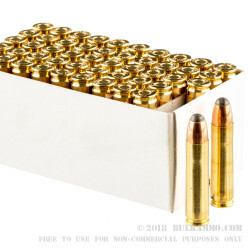 They have expanded their operation to produce over 400 different types of cartridges for all calibers. The 30 carbine round is as historic as the M1 Carbine itself. Produced in the early 1940's it was used in World War II and was a great advancement in technology as it was capable of autoloading from a magazine, which made reloading very easy, and more efficient than a clip or internal magazine. Often considered a collectors item by some, this caliber and firearm are plenty capable still today. This round by Prvi Partizan features a soft point projectile at 110 grains, which is great for hunting or self defense and even target practice. This 110 grain projectile travels at approximately 2001 feet per second. This makes it a relatively light recoil for any type of rifle, but still allows it to pack a good punch. They have been making ammunition for 90 years and have been going strong. 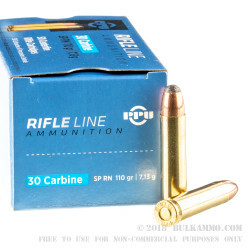 If you are looking for a great round in 30 Carbine, this is a great choice!